The class diagram shows the Root class of OGRE and all of the Manager classes that gives access to the different subsystems. The Root holds a reference to the current SceneManager and to an enumerator that allows other types of scene graphs to be loaded. The RenderSystem is an abstract class that separates the Root from the specific implemention of the RenderSystem, OpenGL or Direct3D. The ResourceManager is an abstract class that is subclassed by a number of managers that handles resources such as textures, materials and fonts. 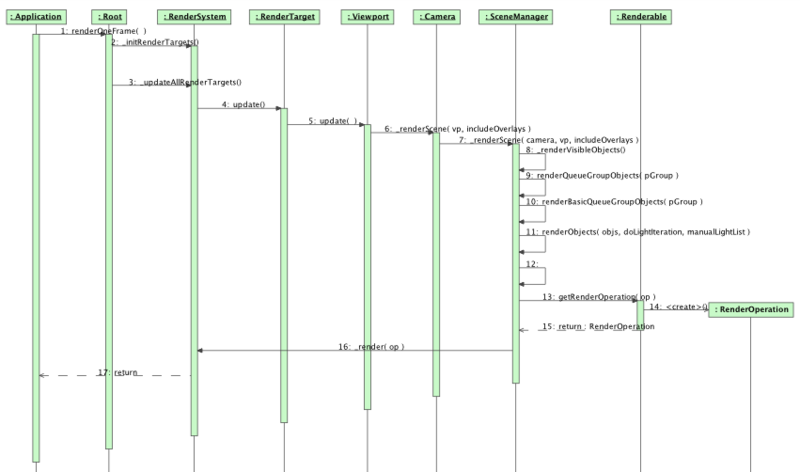 All of the classes in the diagram except for RenderSystem, SceneManager and RenderWindow are using a singleton template to ensure that there is only one instance of each class. Contributors to this page: jacmoe and OgreWikiBot . Page last modified on Monday 04 of January, 2010 17:55:54 GMT-0000 by jacmoe.